Cribox Lotion Anti - crib-biting and the chewing of wooden rails and rugs. Universal - protection against chewing by horses Cribox Lotion Anti - Biting protects all wood surfaces such as doors, walls, boxing, horse trailer, rods, etc., as well as associations, leather gear, ropes, blankets and other things before pitting of the horses. Cribox is composed of natural defense compounds and is completely safe when used properly. 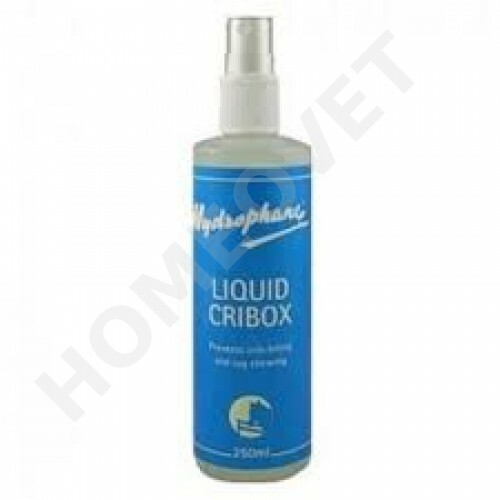 Cribox lotion is very suitable for the foal nibbling on mane and tail, but also for the damage to horse trailers and other items. good use in dogs who bite on the baseboards, doors, etc. Cribox evenly on the problem areas. Cribox is easily washable (e.g. ceilings).